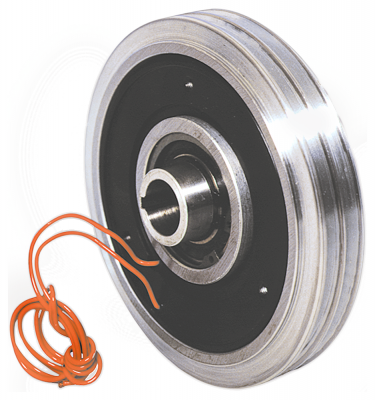 Electromagnetically actuated disc clutches with one friction surface (6 sizes). Nominal torque moment range: from 12.5 to 250 Nm. The torque moment is transmitted by friction between the anchor plate and magnet body without air gap or friction lining. Operation only in non-lubricated environment. The clutch’s design enables fast contact. Contact is possible even at asynchronous speed of driven and driving plates. Unlimited operation at off-state without warm up or wear. It is not necessary to adjust the clutch in operation or carry out any maintenance – the clutch may be installed in equipment with limited access.